Sunny Beach is a lively spot on Bulgaria’s little-known Black Sea Coast. This purpose-built, modern holiday town has rolled out brand-new restaurants, bars and energetic nightclubs across its high rise waterfront. A resort suitable for all disabled wheelchair users. This 5* all-inclusive beachfront hotel is perfect for families looking for a luxurious stay in quality accommodation that provides an array of entertainment and facilities for all ages. Ideally situated on the beachfront with the sandy beach and a green park nearby. 4* hotel and spa offering a range of facilities for children with fantastic food and services. With its timeless design and stunning architecture, this hotel allows guests to indulge in the unique atmosphere and memorable entertainment services, ensuring a comfortable and relaxing holiday. An All Inclusive 4* modern complex perfect for families with a comfortable, inviting atmosphere and fully equipped with a range of facilities and activities for all ages. Surrounded by natural scenery with stunning gardens as well as a shopping centre in the city. This 4* modern hotel is set on beautiful grounds, featuring a swimming pool facing the ocean with just a shore promenade between the beach and the hotel. 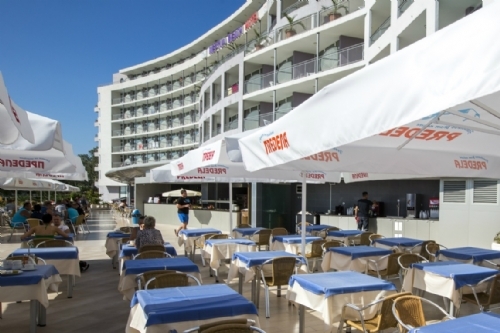 Situated on the beach front just behind a shore promenade in an ideal location with an array of restaurants, shops and entertainment venues nearby. 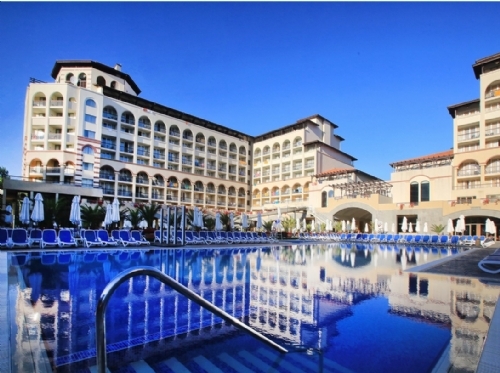 This All Inclusive beachfront hotel is located in one of the premier resorts on the Black Sea Coast, ideal for families with an entertainment programme for both adults and children. Ideally located on the beachfront surrounded by a green park and lush gardens, close to the resort of Sunny Beach and the ancient town of Nessebar. 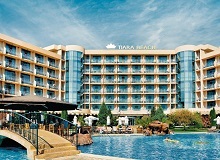 Tiara Beach Hotel is a 4 star hotel that is ideally located by the dunes of Sunny beach, overlooking Old Nessebar. It is approximately 150 meters from the long golden beaches and seafront and close to the shopping areas, restaurant, bars and tourist attractions.